Hello all, I hope you are set for a FAB weekend? It is a bit windy here but I have shedloads of marking to do so the weather is fairly irrelevant. 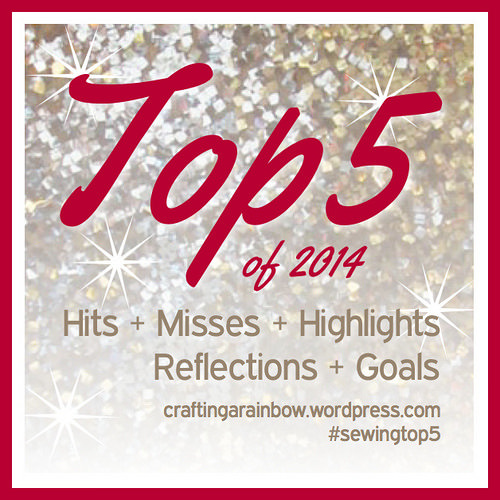 So, my first time of joining in with MMM15 – as I only started sewing in April 2014 it is quite exciting for me to be able to join in. 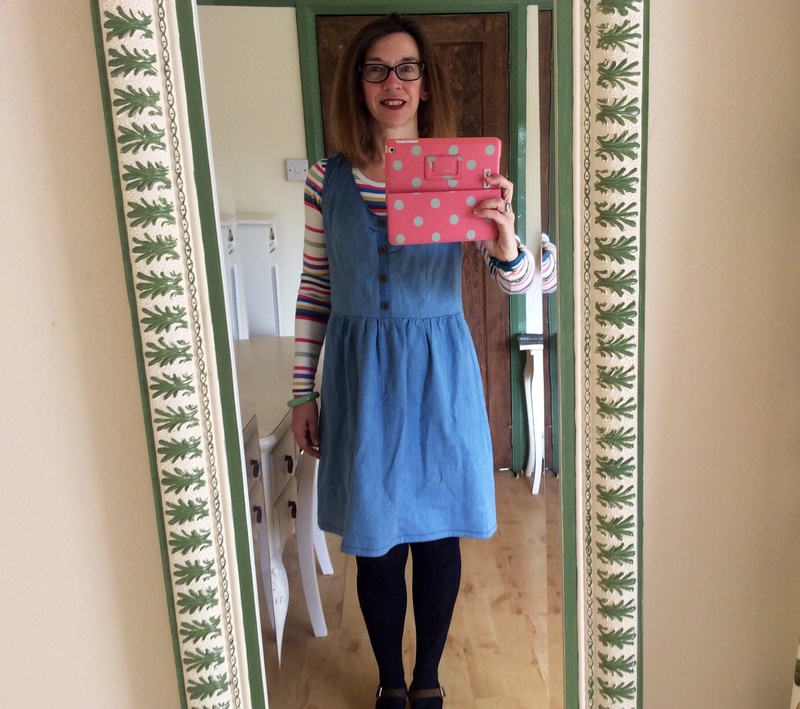 Day 1 – Wearing my Colette patterns Dahlia – this dress was such a struggle to make (details here) – I had so many problems with the neckline. There is an inverted pleat at the back scooping up four inches of surplus fabric (which is why I am wearing a cardigan). The first thing I’ve realised during MMM15 is that it is quite tricky finding someone to take photos for you/of you without feeling deeply embarrassed. 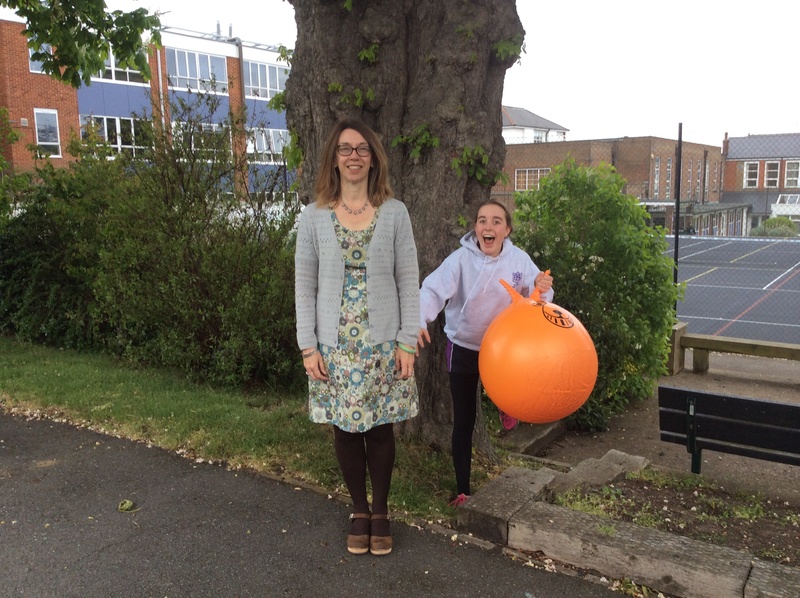 Friday was the last day for our Y11s so we were outside having a class photo and I got one of the students to take this – I hadn’t realised at all that I was being photo-bombed till the girls all started shrieking with laughter. I do like the Dahlia but have yet to brave making another. Day 2 – this is part of my Saturday routine. 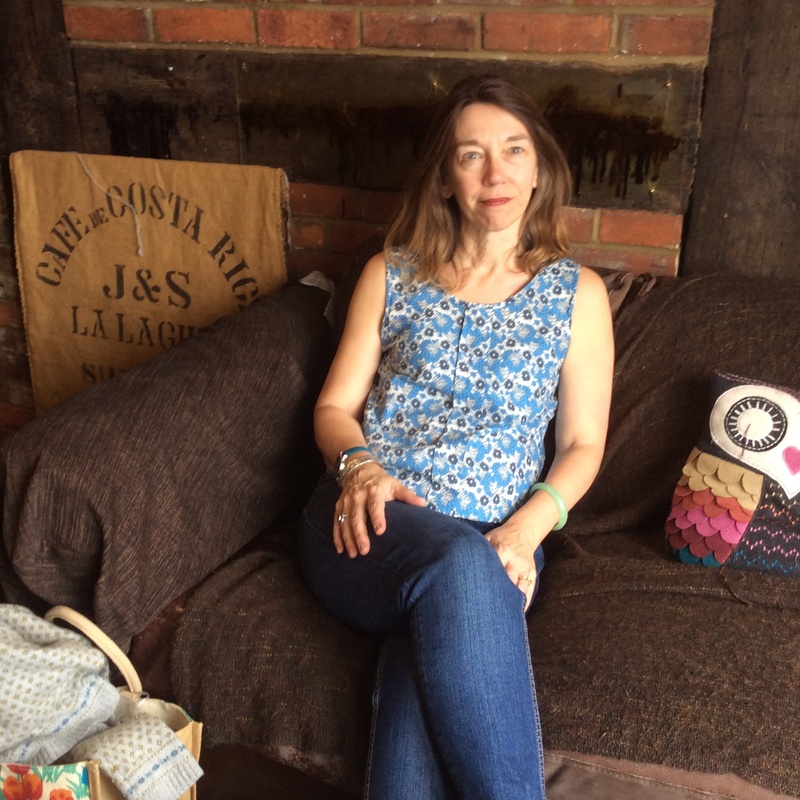 I do the shopping (you can see it on the floor next to me) then I finish up by popping into a local coffee shop for a latte – it is here I usually catch up on blogs. This is another thing I have discovered – MMY15 is an absolute time thief. I am only doing Instagram (I did think about Flickr and Pinterest but thank goodness I abandoned those) but it is taking all my time to keep up with everyone – I actually feel anxious that I might miss something! I have seen some lovely makes over the past week and found some new blogs to follow which is really good. Here I a wearing one of my early Sorbettos – made with leftovers from the dress I made for the work sewing bee. Day 3 – I was pottering about at home trying to finish my Gabriola and popped down to my friend Ali’s for her help with fitting. She was busily adding the finishing touches to her FAB Map Dress (a collar which was apparently later discarded). 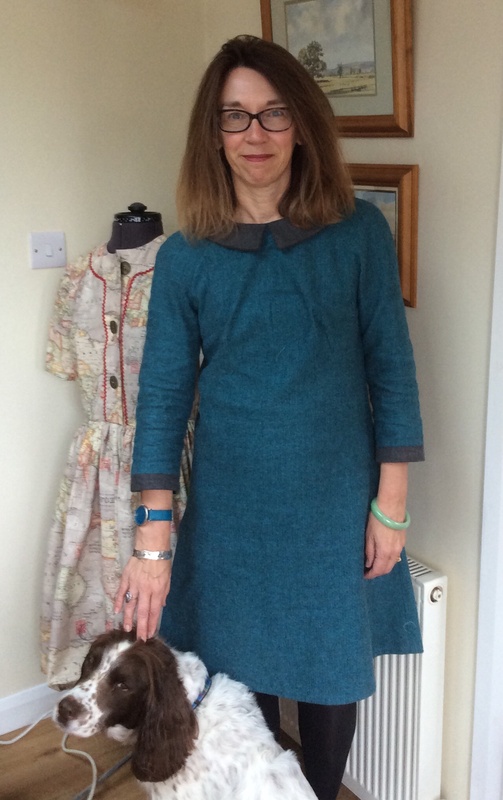 I am wearing my Tilly and the Buttons Francoise which was my Christmas Day dress (another neckline problem for me). What is so odd about this dress is that it looks as if it should be fairly formal/uncomfortable being made in wool but it’s not at all – I am wearing it as a comfy, slob about in, sweater dress. And here is another thing I have discovered – all my garments are too big for me. I clearly do not measure myself properly. Day 4 – Bank Holiday Monday and a glorious day for a walk. 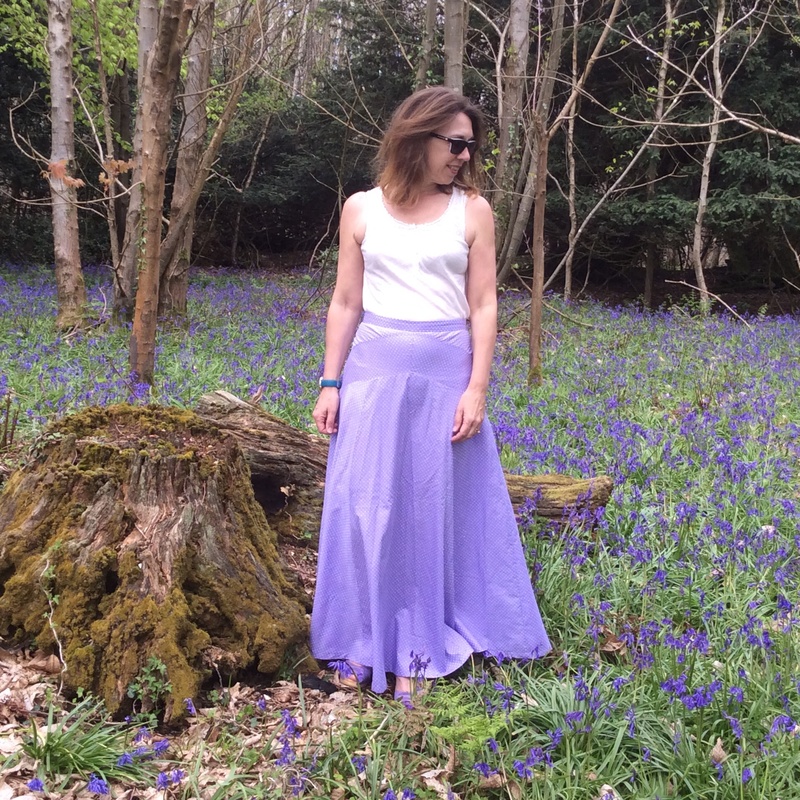 We went off in search of bluebells as I had just finished my Gabriola and thought it would make a great location shot – it was quite fun lurking behind a tree to whip off my Sew Over it Ultimate trousers and change into skirt and heels. 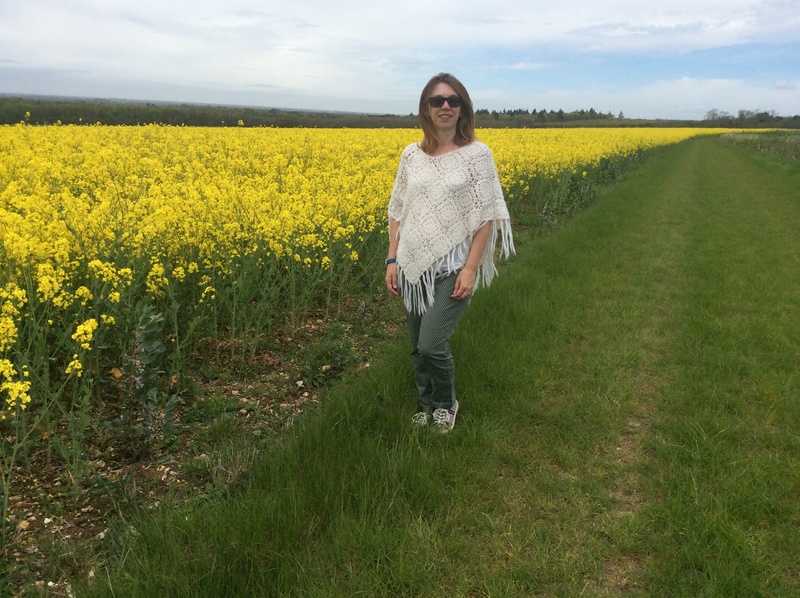 Before we came to the bluebells we passed these gorgeous fields of Rapeseed – I saw three other MMM15 participants on Instagram similarly photographed. 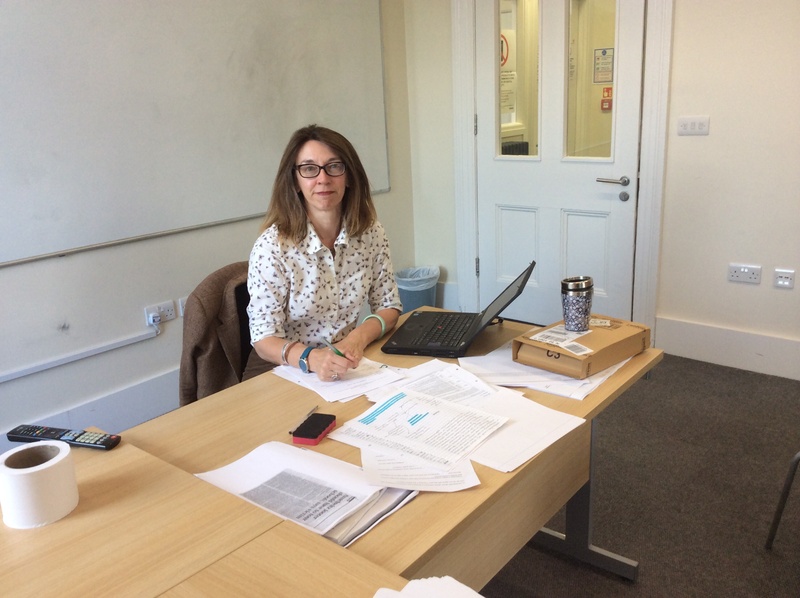 Day 5 – back to work and here I am in one of my Y13 lessons. You can hardly see it in the photo but I made the shirt at a workshop at Sew Pretty and it is covered in little bumble bees. I would say this is my most frequently worn garment – not sure why I haven’t tacked another shirt yet – I certainly have bought patterns. I think it is to do with a fear of buttonholes. Day 6 – I look a bit of a mess here. The skirt is new from Seasalt and even when I bought it I was thinking I could easily make that but I was really drawn to the fabric and then struggled to team it with anything. My Me Made item here is the cardigan which has a cable edge and a single button. I was a knitter before I was a sewer but not a very advanced one and I had never heard of blocking until I started reading blogs. I have really enjoyed seeing all of the sophisticated knits being proudly worn for MMM15. Day 7 – Election day. 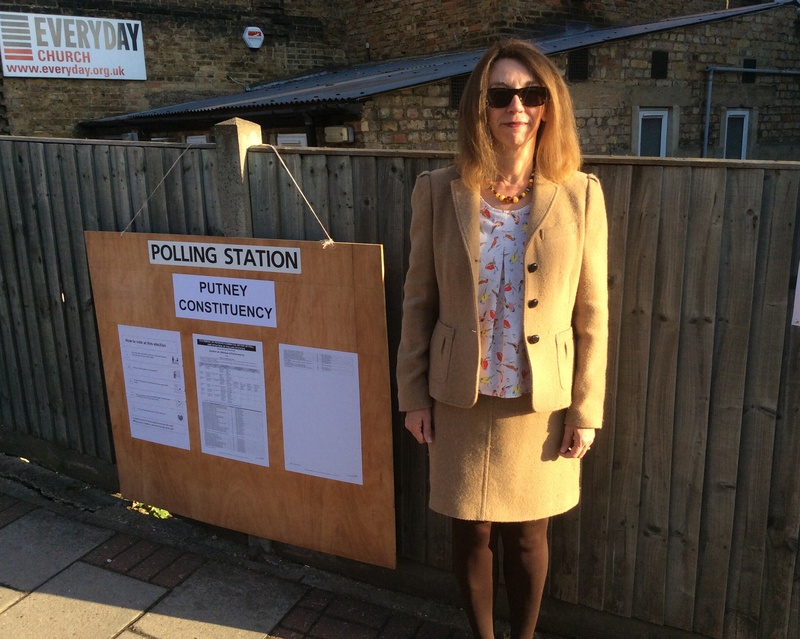 I was waiting outside before the Polling Station opened and asked the guy next to me in the queue if he would take my photo. I explained it was for my blog and he asked what I blogged about – he certainly was not anticipating my answer! 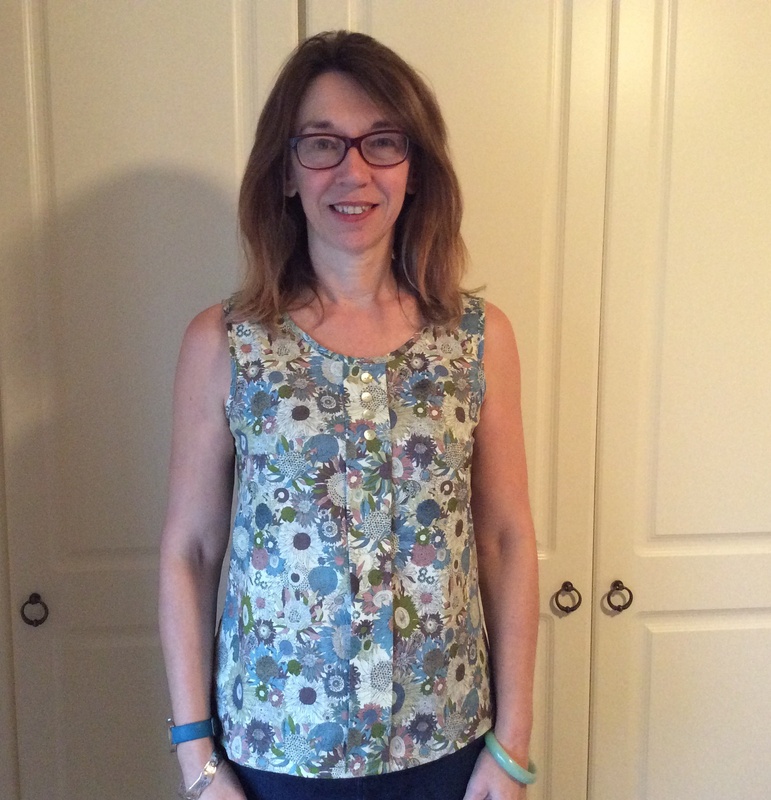 I am wearing another Sorbetto made in a fabric with beautiful garden birds on it. One of my students said I looked very “FatFace” which I take as a compliment. I posted this pic on my Facebook and a number of people asked if I was standing – I guess it does look like it. Anyway, not so smiley the next day as my team didn’t win. 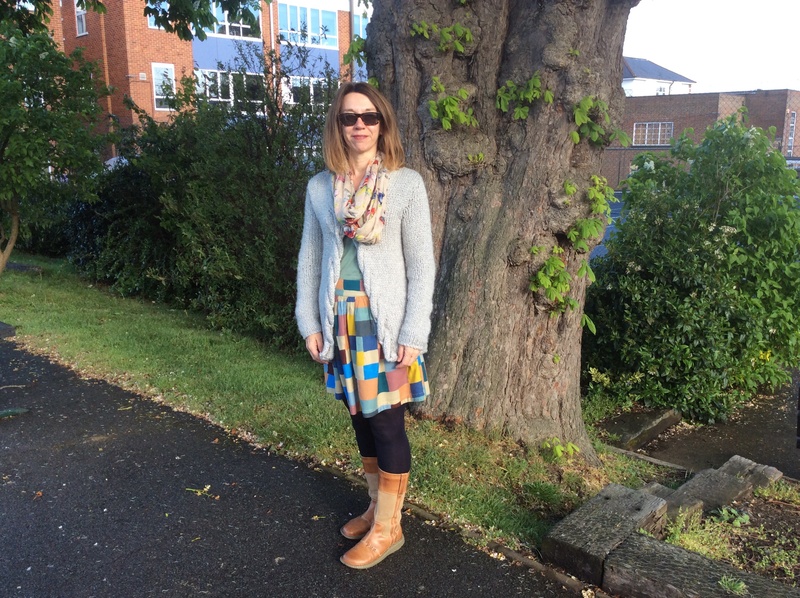 Day 8 – I realise now that the scarf doesn’t go! This is my Tilly and the Buttons Delphine. I have made two now and I have to say – very functional work wear. Day 9 – and so to today! I am home alone which led me to take my first ever mirror selfie. I am wearing my Deer and Doe Sureau which is clearly far too big for me: a shame because I love the denim and antique brassy buttons. 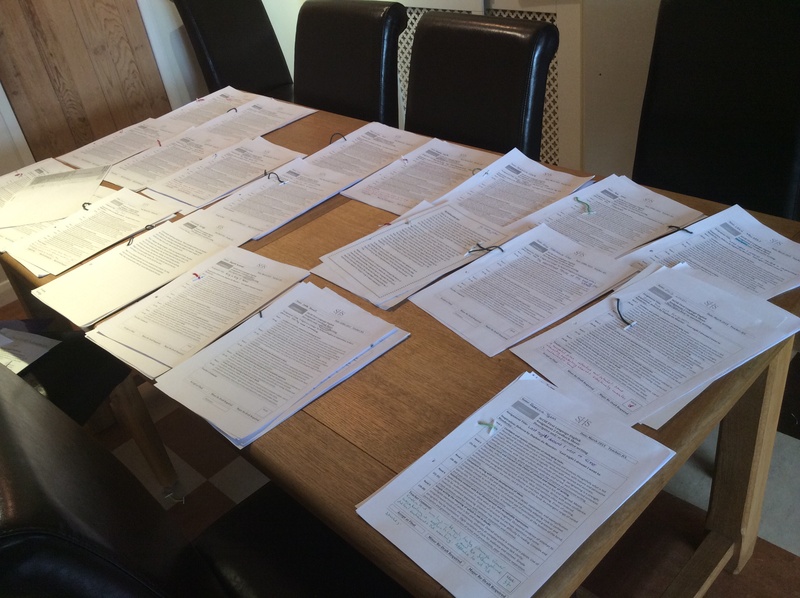 I’ve taken far longer over this blog post than I intended – clearly operating as a displacement activity for what is waiting for me! Thank you for reading, if you managed to get this far! I hope you are having a lovely weekend and enjoying MMM15 if you are playing along. 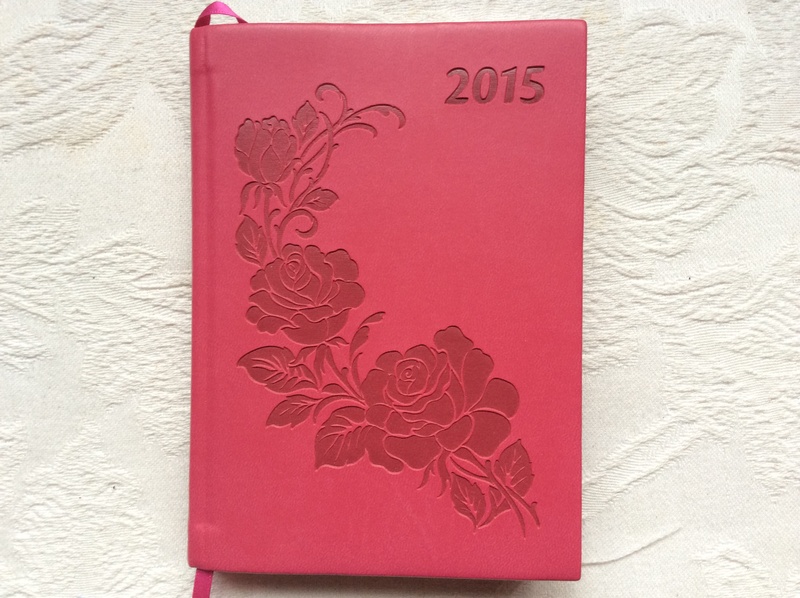 I made it – literally and metaphorically! I rushed to buy Francoise by Tilly and the Buttons as soon as it came out and initially planned to take part in the competition. However, the end of term is so mad that I just never finished in time. However, I loved looking at everyone else’s dresses and it gave me lots of ideas. 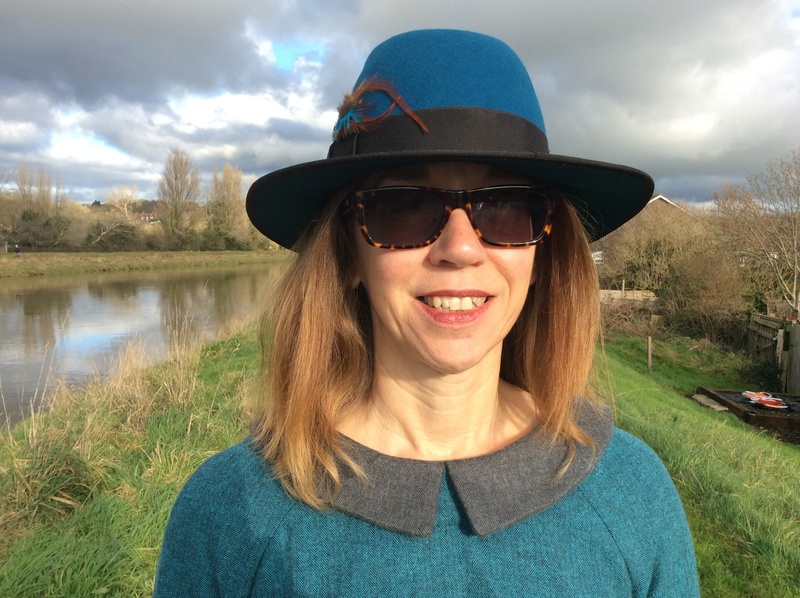 I decide to add contrast cuffs to match my collar – now this might not seem very adventurous to you but this was my first time off piste so to speak and I have to say how chuffed I am with how it turned out. I bought the fabric from Clothkits – it is some sort of wool blend, gorgeously soft to the touch. 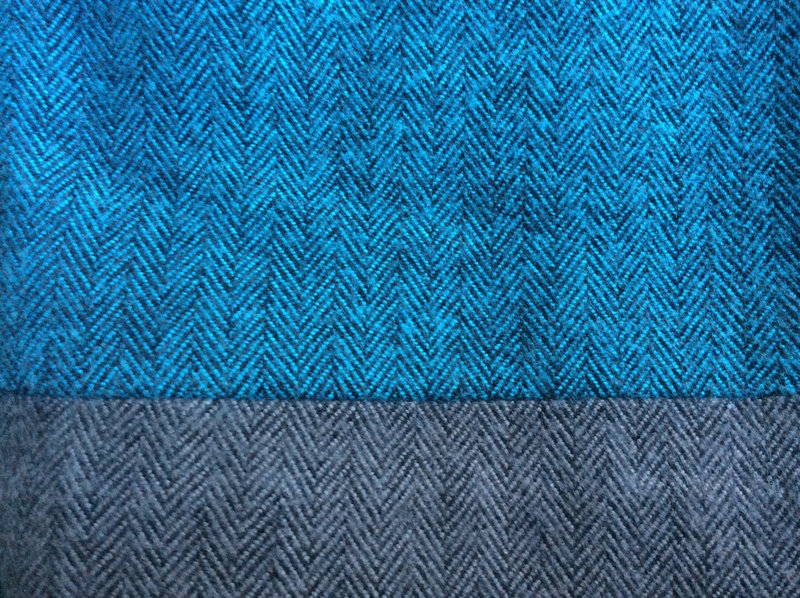 It is a delicate herringbone pattern and I still can’t quite decide if the contrast if black or dark brown. Bits of fluff were coming off all over the place and I am sure I will regret not having made friends with my overlocker yet. I bought one a couple of months ago and am still waiting for a chuck of time to devote to us getting better acquainted. So edges which would really benefit from being overlocked are just pinked – however, I do sort of like pinking – it somehow seems very 1960s. 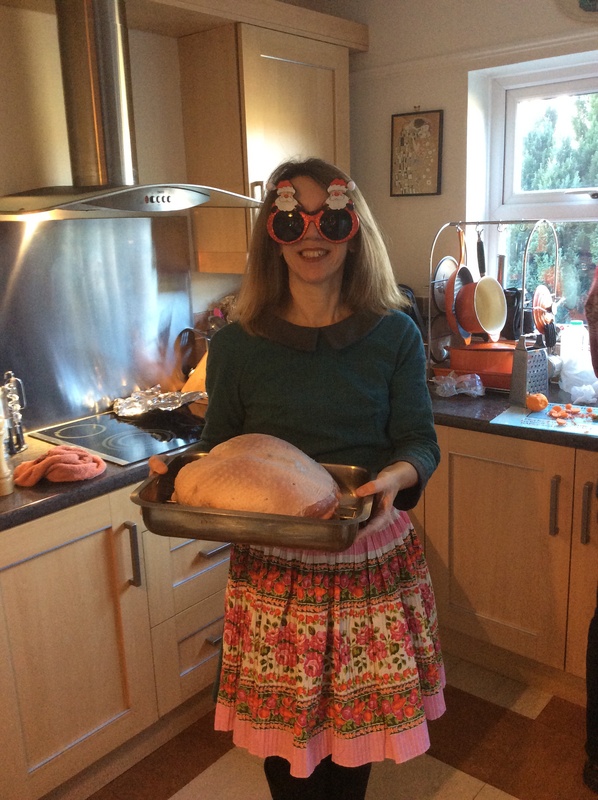 Having missed the deadline for the competition I decided I would have Francoise as my Christmas Day dress – even this looked in doubt but after a final push yesterday and some last minute hand sewing this morning I finally finished it on Christmas Eve. Although, you could well be forgiven for not realising it was 24th December from these photos – it is gloriously sunny here in Arundel – the tide is very high (the river always looks prettier) and I thought that the cathedral would make a festive backdrop to my photos in the absence of snow – although I am sure the neighbours thought I was bonkers traipsing up the garden in a pair of high heeled patent shoes. On reflection I think the dress will look better with my suede boots. In terms of fitting, I cut a size three on the top and graduated out to a four at the hips – I probably didn’t need to do this as there seems to be lots of spare fabric at the back. I’d be really happy to hear from anyone else who has made a Francoise as to how their collar went. I THINK I have messed mine up – it doesn’t go the whole way round the back – I wasn’t sure if it was a design feature but suspect not. You can just see where it ends in my back view shot. 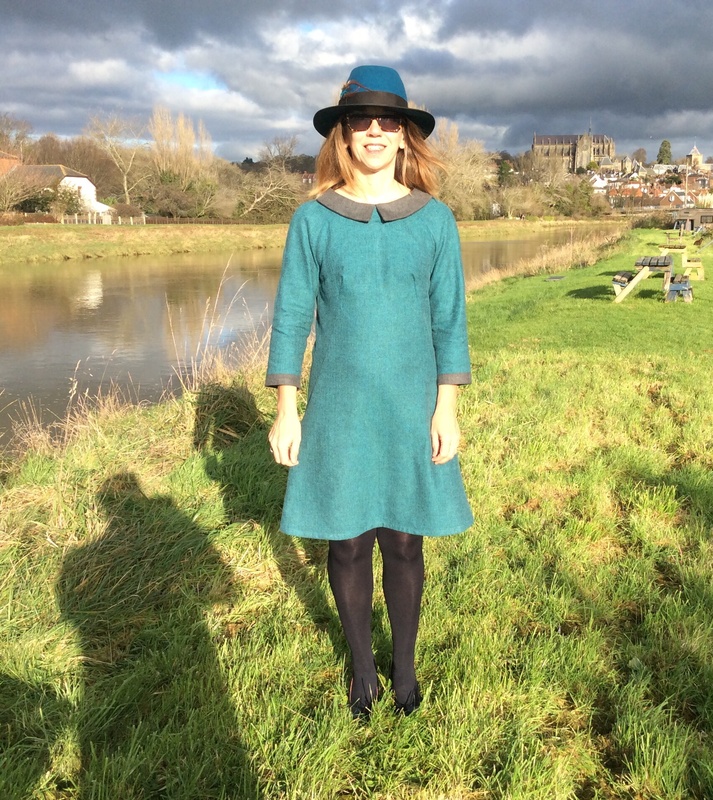 I am super pleased with my dress – it’s my most adventurous make to date (by myself – no workshop hand-holding) and so I feel fairly confident about tackling more challenging projects in 2015: it has been a great first year of sewing. 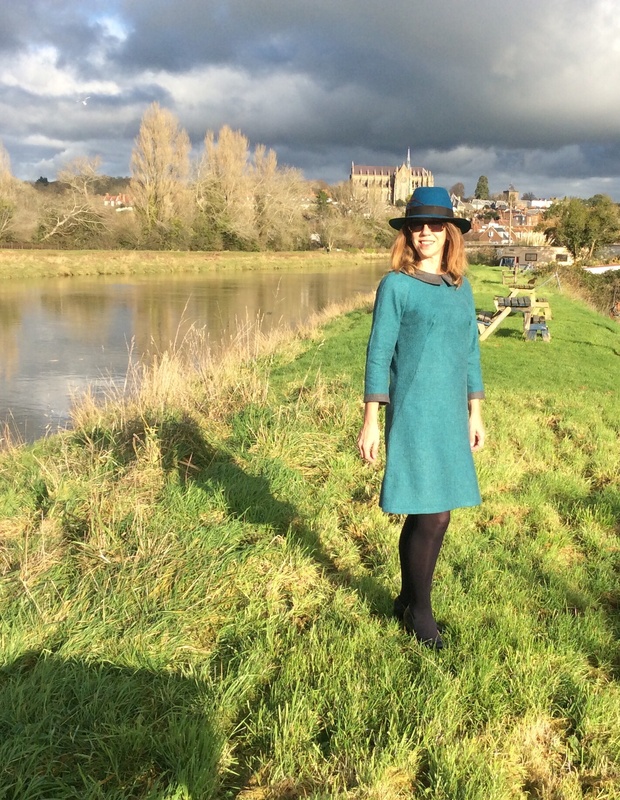 So, from sunny Arundel, very Merry Christmas to you and yours! 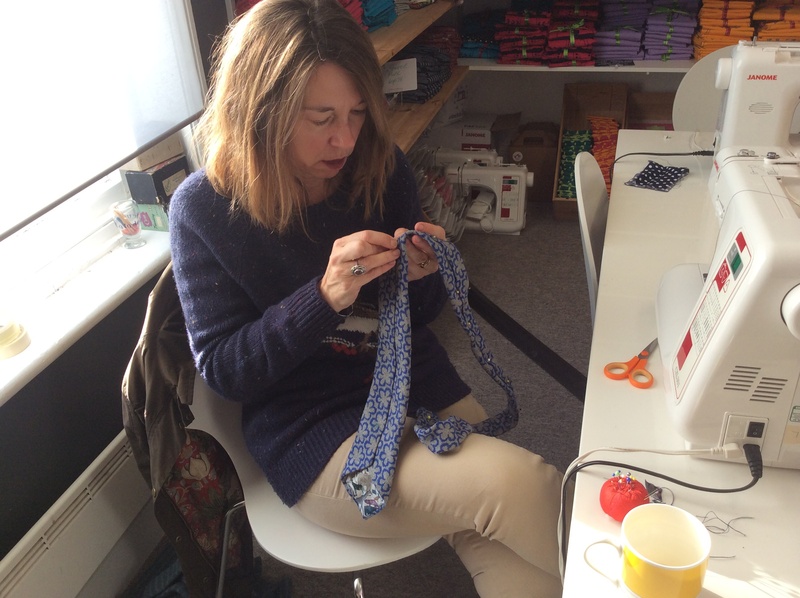 Oh I do love a workshop – I love having an expert on hand to help and give guidance; I love the seemingly endless supply of drink, cake/biscuits and I love meeting other people who sew. Rather last minute I decided to book myself onto Saturday morning’s workshop at Clothkits, Chichester to make a tie. There were four others on the course. 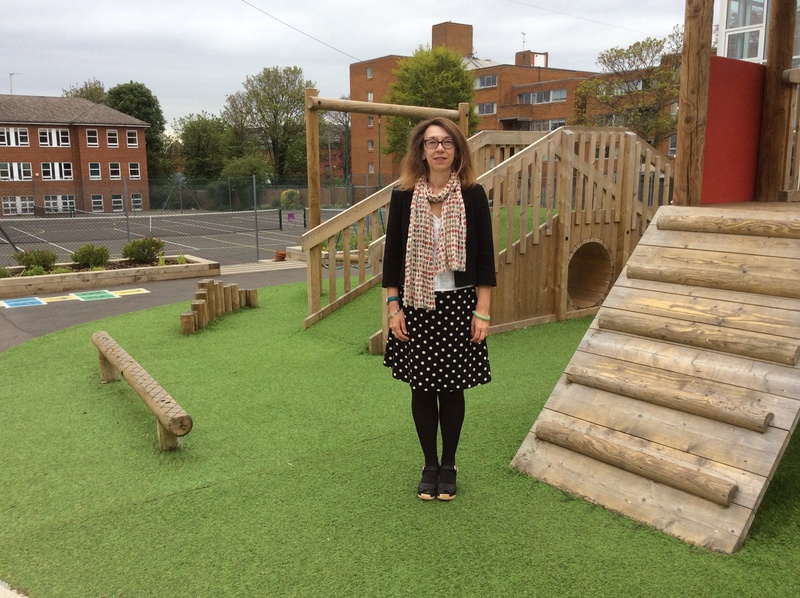 The first task was to choose the Liberty Lawn fabric which we were to use. I had already brought my fabric with me; a gorgeous wool mix I brought from Ghani and Guthrie and for the lining I wanted to use some Liberty Tana Lawn, Queue for the Zoo , which I had bought ages ago to make a blouse and remains untouched. 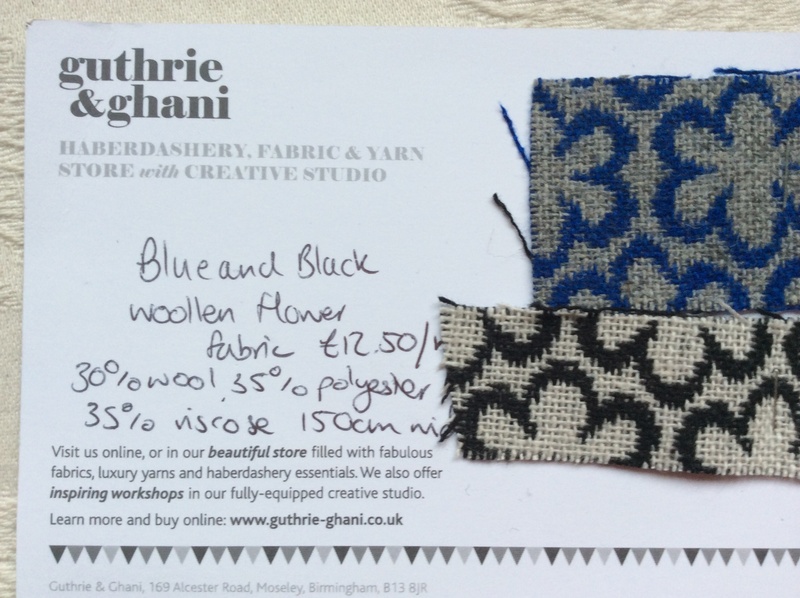 The tutor, Maria Pulley thought that my fabric may be a little too thick but I had my recipient in mind and knew that the grey/blue floral combo was perfect and was not to be swayed! 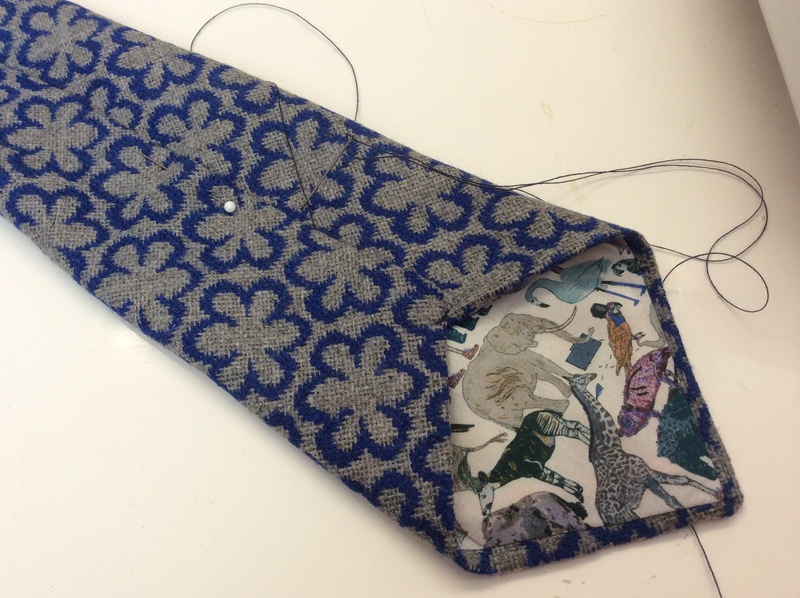 A tie has lots of funny little fiddly bits associated with attaching the lining and getting a good point. I was really pleased to have someone there to show me precisely how to do it but apart from that, I found it relatively straight forward. The most interesting thing for me was the ….silence! Once you have the fiddly bits out of the way, the tie has to be hand sewn. There was a period of about forty five minutes where you literally could hear a pin drop, no-one said a single word whilst we concentrated intently on trying to sew invisible stitches. So, not quite as social as other classes. Here is my sewing concentration face. 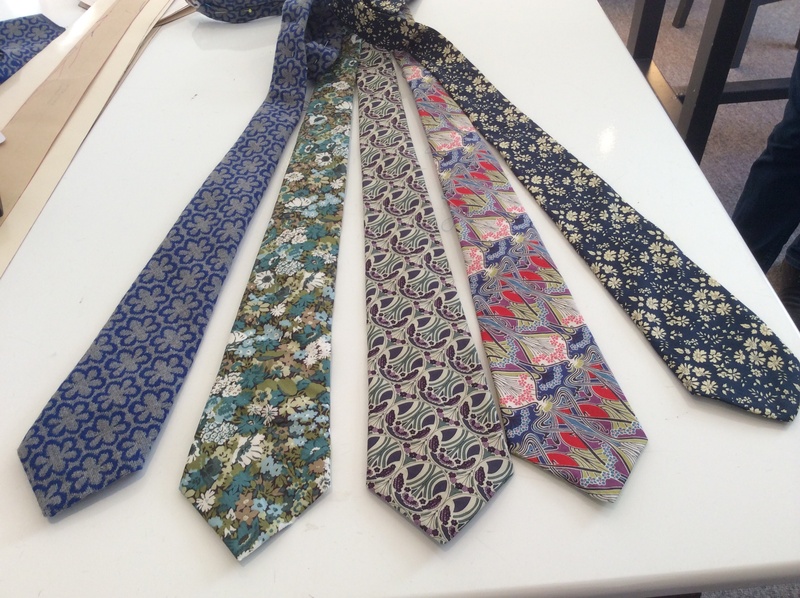 Here are the finished ties – quite impressive for a morning don’t you think. I do love the Liberty prints so will be making more I am sure. In the afternoon I cut out my fabric for Tilly and the Buttons Francoise – there is a contest and photos have to be uploaded by midnight tonight. I don’t think I’ll manage that as today is ear-marked as Christmas card writing day etc but I will give it a go.